Ooredoo has announced a new contest to encourage customers to engage with the company via social media, with two winners standing to win 500,000 Nojoom points each. Befitting the beginning of a New Year, the contests asks participants to think about their goals for 2019 and share them via Instagram or Facebook; they’ll need to take a screenshot or video highlighting their goal for the year, then post it on Instagram or Facebook – mentioning Ooredoo – with the hashtag #ooredoogoal2019. 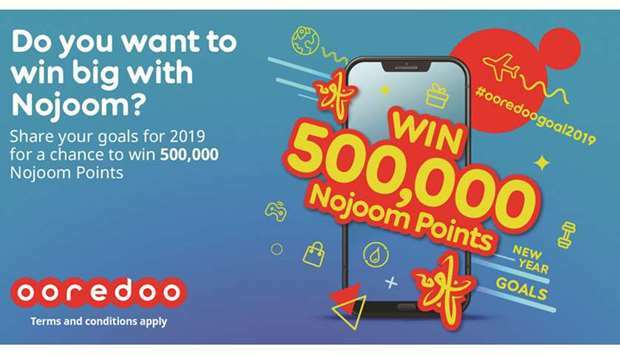 Winners will be chosen at random and walk away with 500,000 Nojoom points each, which they’ll be able to redeem with one (or more) of the partners from the extensive Nojoom network, Ooredoo has said in a statement. Nojoom customers need to share their photo or video on Instagram or Facebook with a mention of Ooredoo and the hashtag #ooredoogoal2019. Those who are not yet members of Nojoom can visit ooreoo.qa/nojoom to find out more and join.